I so wish I had more time to stitch! Even though I was distracted by other obligations, I still managed to complete one flower :) I have been working on this project since July 2013. I absolutely love the project, the fabrics, and the peacefulness that EPP brings to my chaotic life. I swore I would not start another EPP project until I finished this one, but I don't think I can hold back! 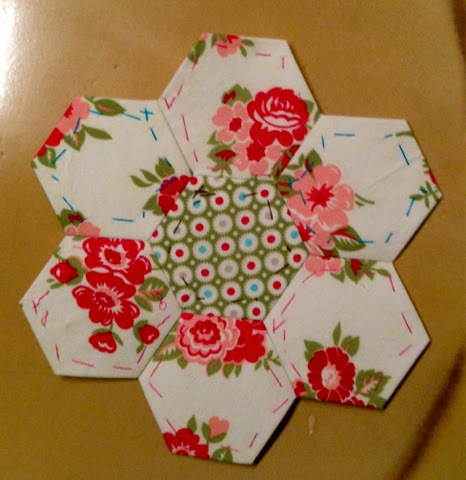 I have picked a pattern out of Jessica's EPP book, Quilting on the Go. I am on a search for just the perfect fabric...or maybe I should use scraps...hmmm..so many choices! As soon as I decide on fabric, I will post, but I am not going to reveal the project :) let's see if you can guess! Feeling very lucky to be part of such a wonderful group of fellow EPP'ers that bring a boatload of inspiration each week! Thank you Jessica at Life Under Quilts for hosting the Monday Morning Star Count! This flower is so pretty. Lovely flowers on the flower. Thanks Lisa! This is one of my favorite prints in the Marmalade line. Thanks Christa! I guess slow and steady wins the race! I like the combination of these two fabrics.